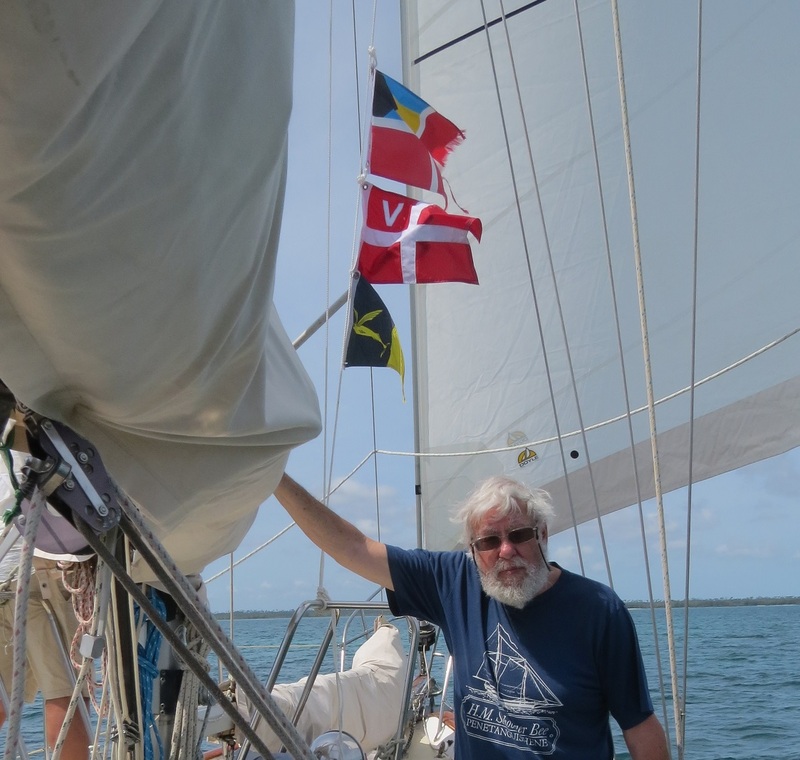 Having sold our Sparkman and Stephens yawl, Fairwyn, in December and being boatless for the first time since 1971, we were delighted to be invited to cruise in the Bahamas last March. In fact, before he had even finished reading the email invitation, Stephen had said “Yes”. The invitation came from Bob Benner and Connie Van Bussel, an Ontario couple we had met in 2012 in the Mediterranean, on their Cabo Rico 38’, Meredith. In fact, we celebrated Canada Day with them at Hammamet Marina in Tunisia. The photo of Fairwyn, dressed for the occasion, was on the cover of the print version of Currents in October of 2012. To join Meredith we flew from Vancouver to Toronto, on to Nassau, and then by small plane to Marsh Harbour, Abaco. Before our departure, Bob asked us if we would be willing to carry a new linear drive for their autopilot. They didn’t need an autopilot to cruise around the Bahamas, but they wanted it to be operational on their overnight crossing of the Gulf Stream. It was easy to pick up the drive in Vancouver and, despite its carton’s 44’’ length, to carry it as regular baggage. 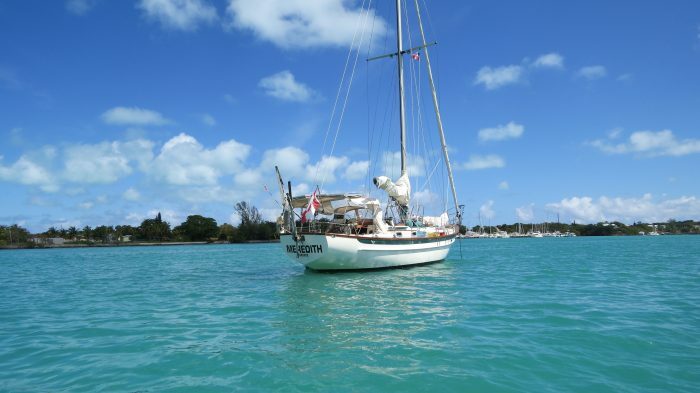 The drive came into the Bahamas duty-free for a yacht in transit (we had to show copies of the invoice and Meredith’s registration), but Customs charged VAT of 5%, apparently a deal since it is usually 7%. 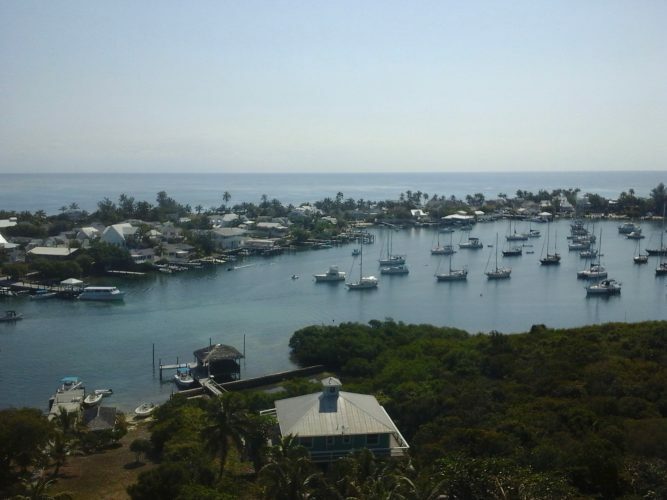 Hope Town harbour from the Elbow Reef lighthouse. 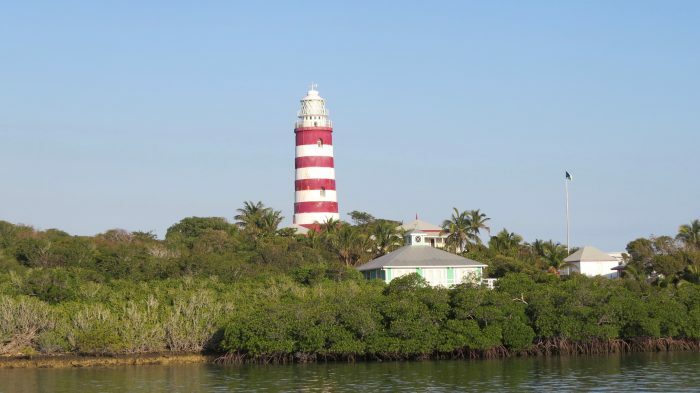 Like Hope Town, nearby Man-o-War Cay was settled by United Empire Loyalists. Among them the Albury family became known for boat building. They successfully made the transition from wood to fibreglass, and Albury 20’ and 23’ boats abound, used by Bahamians and tourists alike. 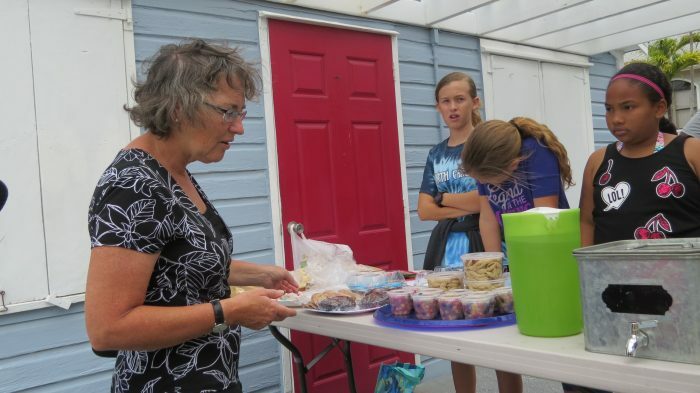 Man-O-War Cay: Our hostess, Connie van Bussel, negotiates for cookies from schoolkids saving for a trip to Eleuthera. 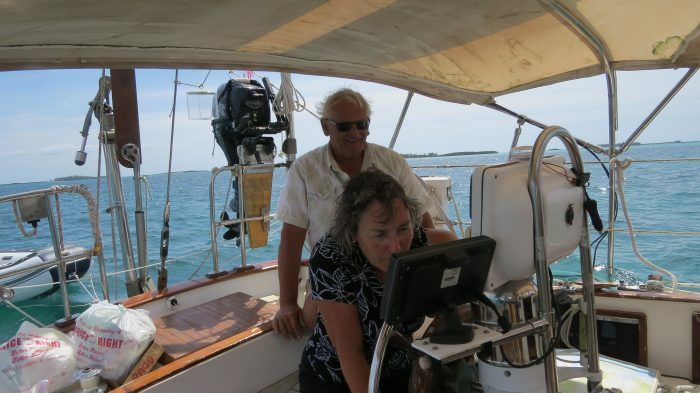 Bob Benner and Connie van Bussel navigate their Cabo 38 sloop Meredith through the Bahamas. Our goal was the Tilloo Bank, a huge sandy bank that almost dries. 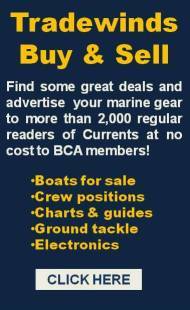 We anchored off the bank in ten feet of water and took the dinghy to the bank where we, as Skipper Bob said, “cavorted” in the shallow water over the white sand bottom. The next day we tried to find a blue hole (underwater sink hole) reported to be in the Bight of Old Robinson (great name, eh?). Unfortunately, the tide was falling to such an extent that it was pouring out of the lagoon that is supposed to be the site of the blue hole, and we kept hitting the bottom with the dinghy motor. Almost all the food in the Bahamas is imported. Exceptions are conch, pineapples from Eleuthera, and the recent growing of market vegetables available in farmers’ markets. As a result, food is expensive both in supermarkets and in restaurants. For Canadians, it is even more expensive because the Bahamian dollar is linked to the American dollar. We understand why Meredith was provisioned in the US before they sailed to the Bahamas. It is difficult to get a meal in a restaurant for less than $CAD 60 per person. 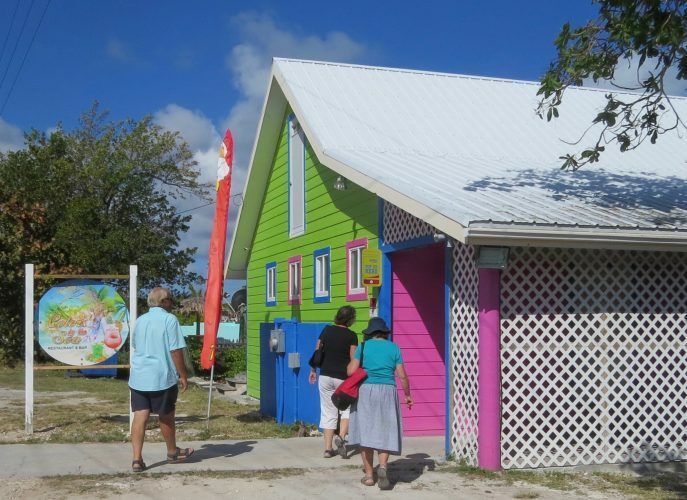 Marsh Harbour: Heading for the “Circle of Colours” restaurant. There are two main Bahamian breweries, Kalik and Sands, that have a variety of types of beer and ale. We particularly liked “66”, a pale ale named for the 66 steps in the Nassau Queen’s Staircase that leads from downtown to Fort Fincastle. Local beers range from $CAD 8 to 11 in a pub and are three for $CAD 8 in a beer store. Stephen and Nancy Carlman first joined BCA in the very early days--1979 we think--but let our membership lapse until 1993. In 1999 we sailed away from Vancouver and ended up cruising for 15 years mainly to the Mediterranean and back, with long stops in Mexico, Ecuador, Cartagena, the Rio Dulce, Louisiana, Virginia, Halifax, the Azores, Sardinia, Malta, and Sicily. we were about 6 months at Treasure Cay. will you be at VRC sat afternoon for Alex C. ” Celeb of Life ” ?